Note this cage is only compatible with GoPro 3 camera in it's naked state or with the original version of splash housing. GoPro changed the latch on the Hero 3 splash housing in September 2013. The image below shows the change to the latch. This version of the Genus GoPro cage is not compatible with the later version of latch. Please study the image carefully before ordering. This cage only works for GoPro Hero 3+, for GoPro Hero 3, please click here. In this package, you can use GoPro Hero 3+ in its splash housing or in naked state. The Genus Cage for GoPro Hero 3+ enable you to use the Genus Cage with your GoPro 3+ with splash housing, keeping your GoPro Hero 3+ in position at all times. Remember to get a 52mm to 82mm step-up ring for your favorite filter. The GoPro camera has enabled you the possibilities of shooting anything and anywhere. Now, with the Genus GoPro cage, your camera can get closer to the action than ever before. Mounting a GoPro Hero 3 camera has never been easier. The need to handle the toughest situations has driven us to design the strongest and most versatile GoPro camera housing in the world. Our new GoPro cage is the first product in the new line of Genus GoPro camera accessories.No Returns on Clearance items,Items are Final Sale. 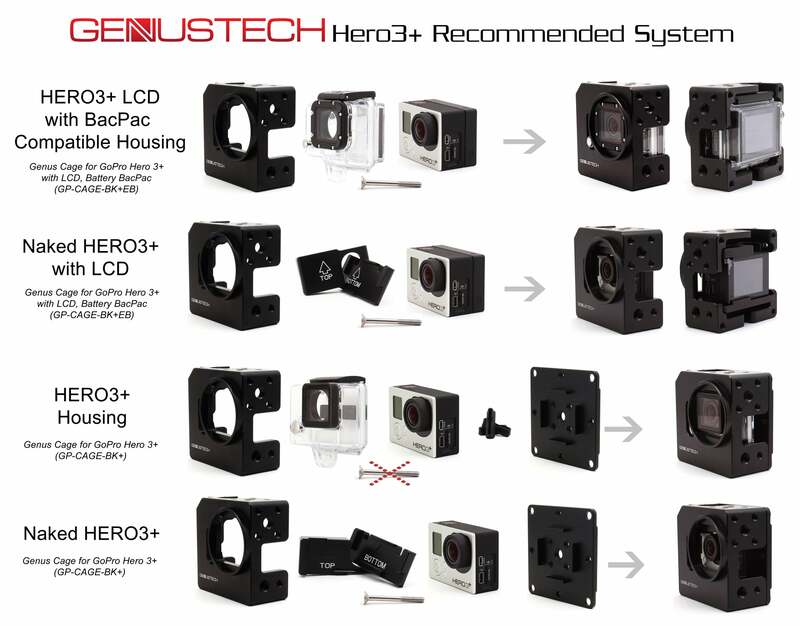 The Genustech ND0.9 filter reduces light by 3 stops. This is advantageous with GoPro cameras as it tricks the camera into using a lower shutter speed. Lower shutter speed reduces "Jello" effects common in GoPro camera footage due , to the camera's rolling shutter, high shutter speed and vibration. Vibration from propellers is a common problem in quadcopter and drone filming . Reduced shutter speed also increases motion blur which will make your GoPro look more cinematic. The filter is 52mm in diameter so it easily screws into the 52mm threaded lens port on the Genus GoPro cage. To buy 52mm ND0.9 filter with GoPro cage, select it in drop down menu next to price. Genus GoPro Cage by Genustech from Genustech on Vimeo. 30 separate accessory mounting positions using ¼”-20 threaded holes. 6 separate 3/8"-16 threaded holes. Mounting position for the cage allows the camera lens to be centred optically with a tripod or other camera mount. When using Go Pro Hero 3+ with its housing, the long screw on the side is not required, but you have to mount the back cover with 3 pieces of silicon inserts on.